McMahon's tenure might have been short. He may have been injured through much of each of the seasons he played for the Bears, and he may have left on terrible terms with the Chicago Bears. 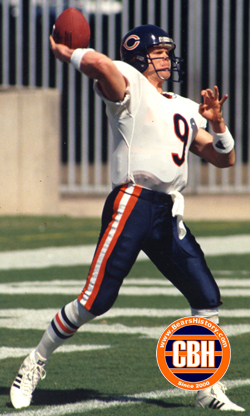 But McMahon remains ranked second on the Bears' all-time career passing list with an 80.4 quarterback rating. McMahon was the second quarterback taken in the 1982 NFL draft behind Ohio State's Art Schlichter, who would famously flame out of the league long before McMahon. The young rookie arrived at Halas Hall following his selection with a beer in his hand, and later wondered why George Halas drafted him as the 87 year old owner criticized him during contract negotiations. McMahon sat out the first two games of his rookie year which we started by Bob Avellini, but following the player's strike he took over as the starter and was named the NFL's Offensive Rookie of the Year that season. In 1983 he started 13 of 16 games, showing continual improvement. McMahon lacerated his kidney in 1984, missing the final 6 games of that season and the playoffs, but rebounded in 1985 to lead the Bears to victory in Super Bowl 20 and received a Pro Bowl berth. From 1986-1988 McMahon suffered a series of injuries, constantly battled with some defensive teammates and coach Mike Ditka, and was finally traded by the Bears to the San Diego Chargers in the 1989 preseason. McMahon would remarkably play another eight seasons in the NFL for six different teams. His record as a starter in Chicago was an astounding 50-22, and former Bears offensive coordinator Ed Hughes called him the best in-game quarterback in the NFL bar none. And personally, having met McMahon twice, I have to say despite his often petulant public persona, one-on-one he's a very personable and accomodating person.